15391 EP GREAT BRITAIN (1970) Charles Dickens*. Essay in black & white printed on card for centenary of Dickens' death. 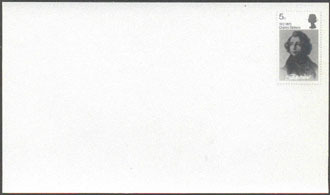 This design was not used in the series but was used on the cachet of the First Day Cover. Designed by Rosalind Dease. 15392 EP GREAT BRITAIN (1970) Charles Dickens*. William Wordsworth*. 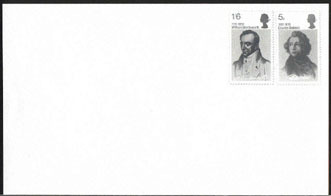 Pair of essays in black & white printed on card for centenary of Dickens' death and bicentennial of Wordsworth's birth. This design was not used in the series but was used on the cachet of the First Day Cover. Designed by Rosalind Dease. 15393 EP GREAT BRITAIN (1970) Charles Dickens*. William Wordsworth*. Mr. & Mrs. Micawber*. Pickwick Papers*. Oliver Twist*. 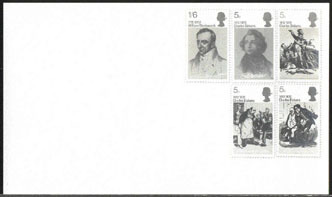 Set of 5 essays in black & white printed on card for centenary of Dickens' death and bicentennial of Wordsworth's birth. This two designs of the authors were not used in the series but was used on the cachet of the First Day Cover. The other 3 designs are as the issued stamps. Designed by Rosalind Dease.